With the huge ammunition shortages over the last few years came a boom of new reloaders. People got tired of not being able to find the ammunition that they needed or if they were able to find it, prices had been over inflated to a point that was ridiculous. We get a lot of phone calls from perspective new reloaders asking what equipment they should buy to get started. Many of them want to jump straight to a progressive reloading machine without knowing the first thing about reloading. To me, this almost seems like handing a teenager the keys to a Lamborghini® on the day they pass their drivers test. Now don’t get me wrong, there is nothing wrong with the progressive machines. They work great and can really speed up your loading process. But with that speed comes the chance that something will be missed or overlooked in the process. When someone asks me what they should buy to get started, I always tell them to buy a good reloading manual and to read it cover to cover before attempting to reload. 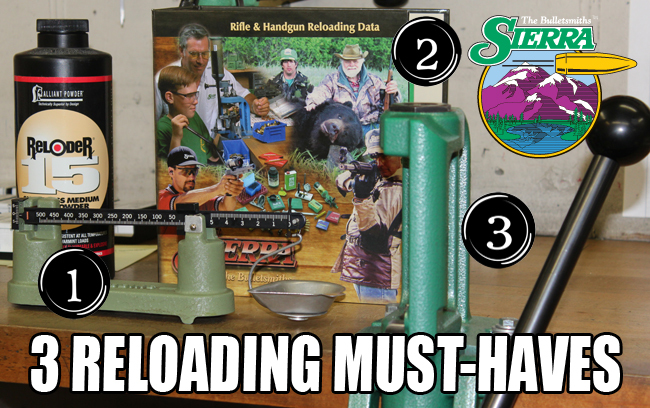 Sierra’s 5th Edition reloading manual is an excellent choice. The Sierra manual contains a lot of information that you just won’t find in other manuals out there. I also tell them to talk with other reloaders and to have a fellow reloader help them to get started. Most hand loaders that I know are great people and are usually more than happy to help someone get started in a hobby that they enjoy. The next thing I usually suggest is purchasing a good quality single stage press. Personally I started with an RCBS Rock Chucker® press about 30 years ago and that press is still going as strong as it ever has. I have literally loaded tens of thousands of rounds with that old press without any complaints at all. Sure a single stage press is slower than the progressive machines, but I feel they give you more control of every step in the loading process. You also will see what every step in the process is doing and have less risk of skipping a step that could possibly be dangerous to the shooter. The single stage press is a great learning tool and as you learn and get more confident with the entire reloading process, you may very well end up buying a progressive machine. But trust me, you will always have a use for a good quality single stage press on your loading bench. A quality powder scale is also a must. I feel that a good beam scale is probably best for the new reloader. I own and use two digital scales, but in all honesty, my old Redding Model #2 beam scale is more accurate and when I am loading with my best precision in mind I always go with my Redding scales. There are many things a new reloader is going to need to get started and we could have a six hour debate over what to buy or not to buy. But in my opinion, if you buy a good loading manual, a quality single stage press and a good set of beam scales, you will be on the right path to a rewarding new hobby. This entry was posted in Reloading and tagged beam scale, beginner reloading, handloading, reloader, reloading, reloading data, reloading hobby, reloading manual, single stage press. Bookmark the permalink. I guess everybody thinks their time is so valuable that single stage reloading would handicap them beyond comprehension. Funny, they never seem to notice the people who have shot a hundred times more rounds than they’ll ever shoot and loaded it all on a single stage. Thanks for stopping by and reading our blog today! Funny how those with “superior” knowledge of what newbie need, mostly tends to screw things up more than help! For myself when I started reloading it was with a Lee Loader. I have a few of them and they work great for many things, especially precision in a bolt gun. Lots and lots of game has fallen to those Lee Loaders. Between them I have loaded thousands of rounds over the years, even for IPSC competition. All on a single stage press. I now have a progressive and can crank out hundreds of rounds an hour, but it will also mess up a dozen rounds faster than you can blink!! The best part is I have an intimate knowledge of what is going wrong when something goes wrong, and it will when reloading. I gained that intimate knowledge by careful learning with other than progressive presses. Now when something is not quite right, I have a much easier time figuring out what, why and what to change. Would not know that if I had started with a progressive. The funniest part to me, is in competition often the people with ammo problems do not have a clue what is wrong, as they loaded it on their new progressive press!?! Couldn’t agree more. I bought a Rock Chucker over 40 years ago and still am using it in spite of the Dillon 550 that sits on my reloading bench right next to it. I use the 550 mostly for my autoloaders. About 8 years ago I tried my hand at long range precision rifle and was immediately addicted to it. I go through about 200 rounds a week practicing and anywhere from 50 to 100 rounds per match day. Yes, I spend a lot of time at reloading but consistency in ammunition comes from consistency in reloading and (in my opinion) I don’t get that kind of consistency with the Dillon. I went to the Sierra website to look at the reloading manual, and saw many comments about the manual needing to be updated – are there any plans for a 6th edition? Yes, we do hope to start on a 6th edition as time and manpower allow. Another really good article on reloading, an especially good one on beginning to reload. I still have my first reloading manuals from the 70’s, along with “The Complete Book of Practical Handloading”, by John Wooters, 1976. At the time one of the more detailed books on reloading. I have more and newer, but they were my first and much of the information is still good for today. It cannot be stressed enough, do not worry about speed when you first start, be concerned about the how and why instead. I also have my first quality beam scale still. The best part, the batteries never die on me! Also, as you mention, the accuracy is beyond reproach! Something to be said for agate beds and taking care of the knife edge for all these years! My single stage Redding Press has produced 10 times more quality ammo than I’ll be able to shoot anytime soon. HA! When I started reloading 3 years ago I found that I enjoyed the reloading as much or more than shooting. I also agree with the Redding beam scale. With that and a trickler I can load cases more precisely and more quickly than my digital scale powder measure. Thanks for a great blog. Thanks for stopping by and reading Shoehorn. Could not agree more , Newbee’s take heed this advice . I have been reloading for a little over 1 1/2 years. I so far have only re-loaded what my wife and I consume which is 9mm and .45 ACP. Other calibers we shoot are still too low a volume or rim fire to reload at this time, although I save the cases. I took three 8 hour classes that covered all types of calibers over the year before I started. Every class I learned something new. I also read all the literature and manuals I could and asked a lot of questions to friends that re-load and supply outlets. The classes covered from single stage to high end multi-stage presses. As I feel case prep/inspection are as important as primer seating, power measuring, loading and projectile setting and crimping (light for my needs). I feel that the only way I can control all the steps is to do them manually on a single stage press using carbide 4 die methodology. I also hand seat all primers not using the feature on the press, but an RCBS hand seater. I have re-loaded over 6000 9mm and 2500 .45 ACP so far with never a failure. The key I feel is to take your time and do not short cut any steps. If one needs to shoot so badly and don’t have time to re-load properly, go buy factory ammo instead of hurrying. I also use an electronic and a RCBS beam scale to verify it’s accuracy as I try to make all loads within .1gn. Good article, but what about the bullets? lol. Sierra makes some awesome bullets, but I have wondered for some time if Sierra will ever make a monolithic bullet. There are some fairly good examples out there, but most, if not all of them, are based on the ultra-velocity platform. Unfortunately, this does little for hunters using a non-magnum cartridge loaded with a less-than-maximum charge. In such cases the monolithic behaves more like a solid projectile. A good monolithic that would expand like a Game King at traditional velocities should make for a fine hunting bullet. Single Stage. Take your time. Load “surgical” precision bullets, avoid short cuts. Sierra Game King in .30 caliber and 7mm caliber, put venison on my table, many years.